A few years ago, a young man named Jefferson Bethke posted a video on YouTube and later followed it up with a book, “Jesus [is greater than] Religion: Why He Is So Much Better Than Trying Harder, Doing More, and Being Good Enough.” He was wrong on all counts. The urge to simply have faith and then do nothing is very alluring and seductive. The urge to make excuses for our inability to serve God as Jesus calls us to do is very strong, and it’s a very old message indeed. But it’s a call to half-serve God, and it’s a repudiation of the message God called and anointed Jesus to preach to all humanity. If you are not actively seeking to walk as Jesus walked, you are not a follower of Jesus. You may be an admirer of Jesus, or a flatterer of Jesus, but not a follower. Jesus calls us to a life of struggle and service, not a life of shallow words and false phrases. 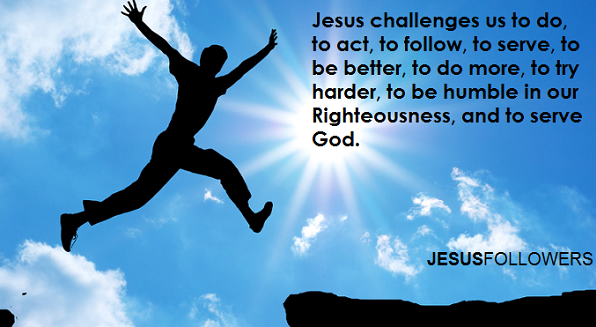 He challenges us to be better than we are, not remain as we were before we met him. "Come just as you are" to Jesus. But expect to change and be changed by his words, life and example. He was meant to be followed, not just admired - he urged us to obey God, not to simply shower him with flattery. The words, life, teachings and death of our Master, Jesus, challenge us to do, to act, to follow, to serve, to be better, to do more, to try harder, to be humble, yet be Righteous, to serve God not money, to lose ourselves and gain eternity. Jesus' call for us to count the costs, then pick up a cross, go the extra mile, expand our 'talents' to serve others, and being the Good Samaritan cannot have meant for us to seek a life of leisure and ease. It's a call to action. If we say we love Jesus, but don't hear what he says, we've built our lives on shifting sands, not the Rock of his Words. The Gospel that Jesus explicitly taught isn't a call to merely have belief in him, but it's a call to serve God, to follow Jesus' teachings, to love others just as we love ourselves. His Gospel calls us to serve and act, not sit and contemplate, nor to simply admire Jesus or even to worship him. And since there is deep confusion among Christians today (sown by folks like Mr. Bethke) let there be no mistake: We are equipped from birth by God to begin the works Jesus calls us to accomplish. We have the ability to recognize Truth, the ability to know right from wrong, to do Good, and to serve others, as Jesus calls us to do. When we repent of our sins, and commit to stop sinning and serve God, then our Heavenly Father will equip us further with wisdom, with hope, with courage and with the strength to endure anything. If we fail to grasp the simple, clear and profound message of Jesus, we will have fallen prey to the error of "easy believism" - the wide road that leads to a failed and worthless faith, rather than a fulfilling one that actively fills the world with love, hope and light. Anyone calling us to a faith of easy belief, of a faith without Works, of emotion without action, of a hope of Heavenly rewards without our hands engaged in helping others, is calling us to "another Gospel" that is false, and "another Christ" who is an imitation of the original Jesus. The clear, challenging religion of Jesus that he first preached is far superior and far more profound and Godly than all the superstitions, mythologies, complexities and unimaginable nonsense men have attached to it ever since. It's time to return to Following Jesus and serving Jesus' God in spirit and in truth. A faith that fails to challenge us to bold, radical service isn't worth having. A free gift is worthless if it's never open and used as it was designed. Jesus offers us such a faith, such a gift, if we would only open it and act upon it.